Welcome to my new blog. Or my 2nd/3rd blog depending on where you have come from. After reading a blog from a good friend (I class all my regular bloggers as good friends even though I have not met any of them IRL) about the ABC’s of blogging, read here, it got me thinking about why I first started a blog in my website (see it here) in the first place. My beads. And wanting to write more than is possible on Facebook. First WordPress blog is started and off it goes on a whole other tangent and I have erred away from the beady posts. I have made an effort lately to make sure I add some in, but it is time to make one purely for my crafty endeavours. Beads, sewing and mixed media. 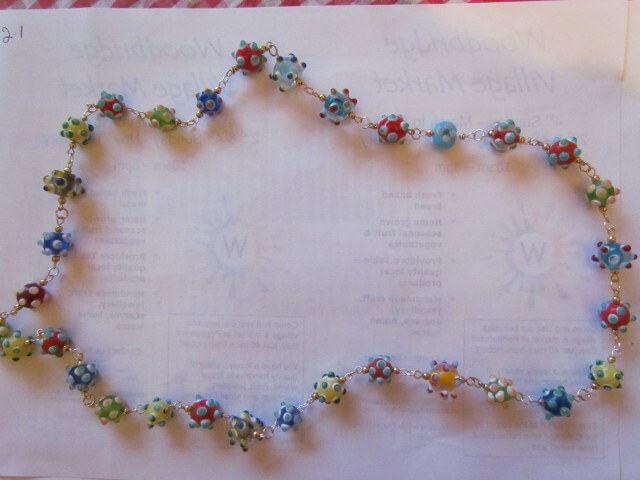 I will write about the good the bad and the downright ugly of beading and craft from my world, aswell as adding pictures of my makes (all for sale as marked) with a sales page for prices etc. Please bear with me for a few days while I get this page sorted and with all the requisite widgety things I want and pictures etc. I have an iPad and it’s a whole new learning curve and finding the right programs to use on here. I will be reblogging old beady posts from my other blog here over the next few weeks. I look forward to hearing about your own crafty times and sharing with other people. This entry was posted in Beading and tagged beads. craft, blogs. Bookmark the permalink. Jennifer, I’m glad you’re getting back into the bead and art blog again. I know it’s your passion. I’ve really enjoyed watching your mixed media art, since I’m a huge art fan. All the best to you on this blog. Thanks for the mention as well. Hope Taz is treating you well, in your patch of paradise. Thanks MJ for helping me out. Loving what you do makes it all the easier. And although i was not thinking of doing it, having a separate blog solely for my craft makes more than a little sense. I heard something the other day (granted its a pretty old saying) ‘find the job you love and you’ll never work a day in your life again’ Or something like that.